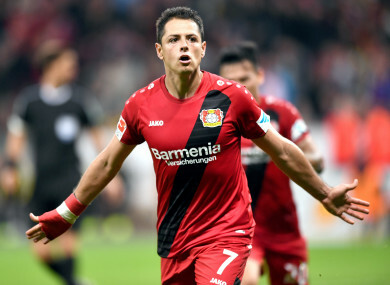 Former Manchester United goal-getter Javier Hernandez looks set for a return to the Premier League as West Ham hope to sign Mexico’s all-time top scorer from Bayer Leverkusen for £13 million in the coming days. The Hammer are also aiming to tie up a £24m deal for Stoke City’s Marko Arnautovic. Spanish striker Alvaro Morata have been angling for a move away from Real Madrid for some time as he looks to find a club that will make him their first choice centre forward. Manchester United and AC Milan have previously been linked with the ex-Juventus man, but reports suggest the 24-year-old could link up with his former manager Antonio Conte at Chelsea. The Premier League champions, meanwhile, may miss out on Morata’s club mate Danilo, who is reportedly on his way to Manchester City for around £31m. Chelsea’s out-of-favour Nemanja Matic was widely-expected to join Manchester United and his old boss Jose Mourinho, but there is talk now that the Serbian midfielder will instead relocate to Turin after his agent discussed personal terms with Juventus. Liverpool appear to be close to securing the services of Scottish left-sided full-back Andrew Robertson from relegated Hull City. The 23-year-old will become the Reds’ third summer signing for around £10m once he passes a medical tomorrow. Elsewhere, Tottenham remain keen on Everton’s Ross Barkley but The Mirror claims he is demanding wages of £150,000-a-week — that’s higher than than Spurs club captain Harry Kane and goalkeeper Hugo Lloris! Derby County paid £600,000 to bring Paulo Wanchope to England from Herediano in his homeland on 27 March, 1997. And the 20-year-old Costa Rican striker took no time at all to endear himself to Rams fans — scoring a wonderful individual goal against Manchester United on his debut in a 3-2 win at Old Trafford. Wanchope took the ball inside his own half and dribbled past four players before slotting beyond Peter Schmeichel. He went on to score 23 goals in 65 appearances for Derby before moving on to enjoy spells at West Ham and Manchester City and also represented Costa Rica at two World Cups. Email “Chicharito close to Hammers move, Reds signing full-back and today's transfer gossip”. Feedback on “Chicharito close to Hammers move, Reds signing full-back and today's transfer gossip”.